SGPA and other local design firms had a recent opportunity to participate in the region’s inaugural Career Fair for Architectural/Planning/Interiors and Landscape students. 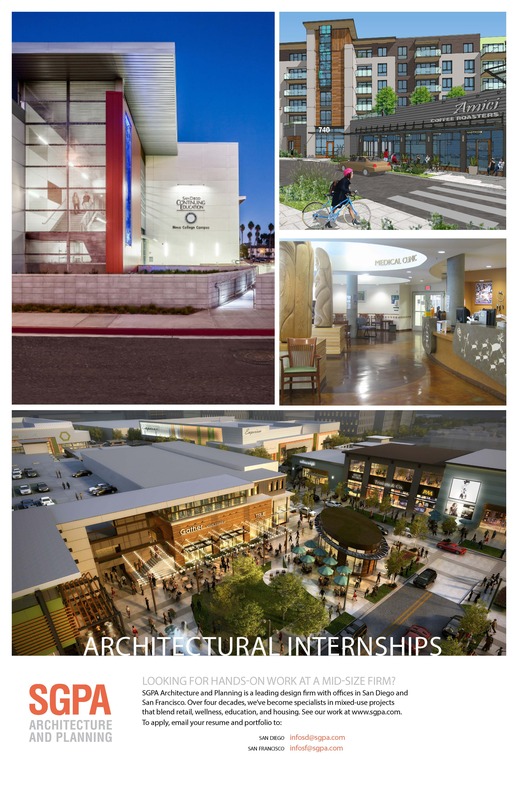 Sponsored by The NewSchool of Architecture and Design and Woodbury University, San Diego, the well-coordinated event gave the region’s emerging professionals a forum to take their first steps toward building careers in the design industry. The Design Institute of San Diego, the University of California, San Diego, the University of San Diego, the American Society of Landscape Architects, and the San Diego chapter of the American Institute of Architects also participated in the fair, held at Balboa Park’s Recital Hall. We found it to be a positive experience for both the students and firms. SGPA stood out as a supportive employer as we were joined by our three-year intern from Woodbury University, Derek Buskirk. Scheduled to graduate in May, Derek represented the firm well and provided insight into the students on the other side of the table. Students enjoyed interacting with the different firms, exploring what each had to offer and meeting the people behind company names. The Career Fair also offered them an ideal time to seek valued feedback on portfolios and resumes to aide their job search. Interviews can be nerve-racking; this event’s format, with its conversational chatter and relaxed atmosphere, made it easier for students and employers alike to approach one another and network casually. “From the design firm side, it was exciting to see all the fresh, energetic students participating. There is definitely a new pool of talent with a wide variety of skill sets and interests. It was refreshing to see the abundance of energy and talent. We hope to follow the event with second interviews of outstanding candidates,” said Keith Pittsford, Vice President and Director of the San Diego office.